Joseph J. Wirth, founding senior partner of Mainor Wirth Injury Lawyers, believes in representing real people, not big business. He has extensive courtroom experience representing victims of serious injuries and medical malpractice, especially those who have suffered spinal injuries, chronic pain, and traumatic brain injuries. He prides himself on his caring and empathic approach to working with his clients and their families, and often makes unsolicited phone calls to his clients to check on them. Joe has used this approach to try cases to verdict in excess of a million dollars and maintains a zero-loss record in arbitrated matters. Some of Joe’s more recent successes include a 5-million-dollar settlement for a victim of a negligent massage at a hotel spa and a 3-million-dollar recovery in a disputed liability tractor-trailer case. In 2010, Nevada Business Magazine voted Joe as one of Southern Nevada’s Top 100 Attorneys. Joe was also recognized by The National Trial Lawyers Organization in 2014, as part of The Silver State’s Top Attorneys. In 2015, My Vegas Magazine honored Joe with an award for making its Top Lawyers of Las Vegas list. The National Academy of Personal Injury Attorneys presented Joe with the 2015 Nationally Ranked Top 10 Under 40 award. Also, Joe has worked pro-bono in family court, and carries a zealous attitude on the State Bar of Nevada Advertising Committee. 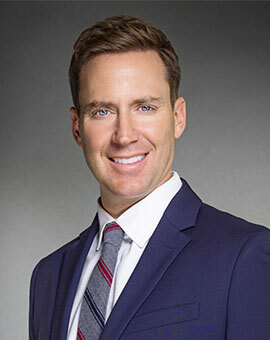 He has earned his reputation as a highly-respected member of the Las Vegas legal community, and takes pride in receiving most of his cases as referrals from other attorneys, medical professionals, and most rewardingly—prior clients. © 2019 Mainor Wirth Injury Lawyers.